Bao Viet Life Corporation is a member of Bao Viet Holdings – one of leading financial-insurance groups in Vietnam with 100% of the capital owned by Bao Viet Holdings. As a pioneer in the Vietnamese life insurance market, for over last 19 years, Bao Viet Life continuously sustained the leading position in the market despite the fact that Bao Viet Life is the only domestic company to compete with 16 foreign insurance companies. Bao Viet Life is life insurer with largest chater capital 100 million USD. Bao Viet Life is only life insurance Company in Vietnam market which has national-wide distribution network. Over the past 19 years (1996 – 2015), Bao Viet Life Corporation has provided financial plan and protection for more than 5,000,000 customers; nearly 1,5 billion USD amounts of benefits were paid out to the customers. Currently, the product portfolio provides to customers a wide range of selection of nearly 50 products. Particularly for many years, the universal life product is one of the most attractive products in the market with high guaranted interest rate and flexible benefits. Bao Viet Life’ products reach the international standards with localized features to meet the demand of customers and to bring the added value to customers. In 2014, Bao Viet Life was recognized as a leading insurer in the market in terms of contributing the corporate income tax to the national budget. Bao Viet Life also received other rewards such as: Strong Brand Award, recognition as one of the top 30 corporations with active donation activities for children. The corporate governance structure in accordance with international standards: After more than 7 years of successful equitization of Bao Viet Holding, Bao Viet Life Corporation had completed the transition process. Especially an advanced corporate governance structure had been build up in accordance with international practices. The emphasis was put on operational management, actuarial, risk management and compliance to ensure the long- term sustainable growth. Bao Viet Life Corporation currently is the only domestic life insurance in the market but it work with international standards. In 2014, total Revenue reached 10.765 billion dong, increase 26.9% compared with 2013; New Business revenue reached 2.093 billion dong, increase 31% compared with 2013, which was higher the market rate (16.2%). Growth rate of 2014 was the result of growth from the previous year (2012, 2013) with annual growth rate is 24%. Profits also increased steadily over the years, in 2014 profit before tax was 755 billion dong, increase 7.4% compared with 2013, to be continued to contribute greatly to the consolidated profit of Bao Viet Group. ROE in 2014 was 29.5%, ROE in 2013 was 26.5%. Declared Interest rates for 2014 fiscal year for universal life product was 10% and traditional product is 8.5% – the highest rate in the market. Strong and sound financial strength: With investments from Bao Viet Holdings, Bao Viet Life Corporation is the life insurance having largest charter capital in the market. Total assets of Bao Viet Life Corporation stably grew over years. At the end of 2014, total assets was over 30 trillion VND, increased 15% as compared to 2013. The asset structure of Bao Viet Life Corporation has been stable over the years thank to prudent and sound investment policies with optimized portfolio. Bao Viet Life Corporation assets were mostly invested in long-term assets such as government bond, deposits in accordance with law requirements. The total amount of re-investment of Bao Viet Life Corporation accounted the biggest proportion of the total investment in life industry. At 31/12/2014, solvency margin of Bao Viet Life Corporation was 144% which could meet all short-term and long-term financial liabilities. 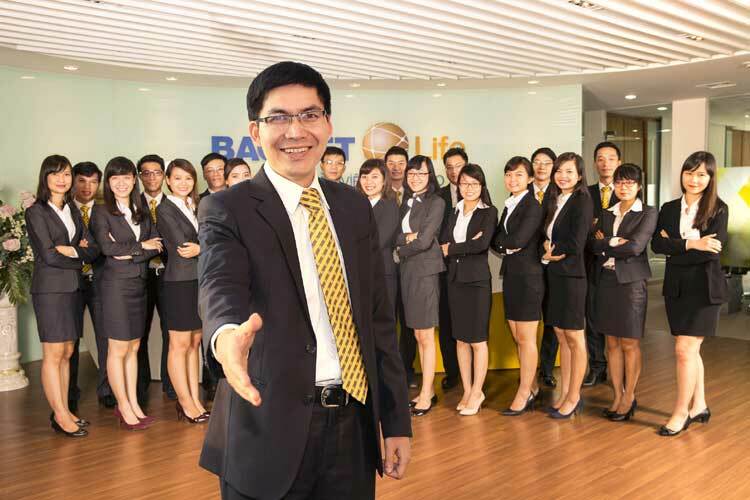 Multi-channel and nationwide distribution network: in order to serve all customer segmentations, Bao Viet Life Corporation has a multi-channel network, which includes agent, banccasurance and telesales channels. With centralized management model and system of 60 branches with more than 300 sale points, Bao Viet Life Corporation has the advantages in both business development and customer service. For customer services, the wide office branches system helps to meet the demand of customers in term of customer care services. The agent force has been continually expanded, the total number of agent at the end of 2014 reached nearly 52.000 agents, increased 53% compared to 2013 with highest agents’ productivity compared to market level. Bao Viet Life Corporation always complete the duty to the State budget: Bao Viet Life Corporation was recognized as the top corporate in term of paying income tax in Vietnam in 2014 (award by Vietnam Report Joint Stock Company, General Department of Taxation of Vietnam, VietNamNet Newspaper and other local and international independent consultants). Environment and community responsibilities: Every year, Bao Viet Holdings invested 10% of profit after tax for community activities. Bao Vietnam Life had followed the Holding’s guidance and actively implemented activities in poverty reduction; education and young people; natural disasters resistances. Activities on environment, green business were also implemented. Additionally, Bao Viet Life Corporation actively participated in other community activities such as: Poverty alleviation, Investment in education and youth projects, Appreciation of war martyrs, Natural disaster recovery. In 2015, marking 11 years on Bao Viet Life Corporation accompanies Life Children Protection Fund of Vietnam (Foundation) implement scholarship program and presented gifts to poor and studious children on special occasion such as Children Festival, Full Moon Festival, and Lunar New Year. In 2015, Bao Viet Life Corporation donated more than 1.200 bicycles to the Fund through the program “Education Scholarships – Free Bike to School”. The most significant thing the program does not mean only giving 1,200 bicycles to poor and talented children but through this program has had many personal, social organizations, enterprises are more interested in small children which tend to drop out from school due to lack of school facilities. Besides Bao Viet Life sponsored programs on the Internet ViOlympic math which is organized by the Ministry of Education and Training, FPT University. More specifically, dated 20 January 2015, Bao Viet Life, Ministry of Education and Training and FPT University launches website ViOlympic (baovietnhantho.violympic.vn) satisfy the desire of millions of students and parents across the country. 2014 is also the year that Bao Viet Life Corporation was recognized by Government for positively contributed social activities for children in 2014. High growth rate in business performance in the past years and outstanding growth rate in 2014 has showed Bao Viet Life’s sustainable growth with the increasing trust of customers.